In B/X and I believe most OSR games these days the primary source of experience points for PCs is treasure which they bring back from their adventures. If you go with the rules as written the XP gained frok overcoming enemies is tiny to the point of being marginal if you want to have even a modest pace of character advancement in a campaign. I quite like this approach as it makes lethal combat a means to an end instead of being the end in itself. And only one means among many others. But while giving one XP for every gold piece found in a dungeon and brought back to town works well enough for a game about treasure hunters it does have it’s limitations in pretty much any other scenario. I think mines are a great environment for a dugeon crawl, but how much treasure can you hide down there in an at least somewhat plausible way? Or take adventures in which all the opponents are wild animals or spirits with no use for treasure. Simply putting big pots of gold in random places is neither believable, nor fun. A simple workaround for this are bounties and rewards. An owlbear with 1,000 gold coins in its cave would be silly. But an owlbear whose head is worth 1,000 gold coins when delivered to the village elders really doesn’t stretch plausibility in any way. (Aside from gold being apparently worth almost nothing in most fantasy games.) Yes, a trophy is not exactly a treasure. But there is plenty of precedent of valuable tapestries and paintings whose only worth is that someone in town will give the party a bag of coins for them, and they have always been regarded as treasure that counts towards calculating XP. Treating reward money for things done in a dungeon as treasures taken from the dungeon is a perfectly valid thing to do. Another nice trait I like about NPCs announcing rewards for certain things is that it’s more noncommittal than having an NPC hiring the party for a quest. When you send the players on a quest it brings with it the expectation that there’s a planned plot that the players are meant to play out and I think I’ve never seen players deciding to just not complete a quest unless they were obviously set up by an evil NPC. A notice of reward is much more open ended and more of an optional objective that can be done when doing stuff in the dungeon. If there’s plenty of other stuff to do and grab, players are more likely to think twice about asking a dragon for his head or taking a gem that keeps an underground garden alive. Decisions are always the most interesting when there is no obviously better option to pick. Running an RPG really is an art. Primarily because rulebooks almost never even mention how you do that. The first edition of D&D was a collection of notes that an apprentice DM would get after he had been trained by an older master and somehow everyone kept doing that ever since. Two page Examples of Play are garbage. The only exception I know is the 1983 Basic Set for D&D. And that is after four decades and hundreds of games. Other than becoming an apprentice of the GM of the group you play with (simply observing a good GM at work won’t do it), the only people who can teach you to be a good GM are old GMs who explain it on the internet. The Angry GM and Matt Colville are both super helpful and there’s a lot of equally great stuff by The Alexandrian. (Links to all three are to the right.) I think I was a pretty poor GM myself until I started doing more research three years ago. Practice alone doesn’t make you any better if you just keep making the same mistakes every time. But all the methods to use as a GM are only options and not all of them work for every purpose. You need to have some reasonably clear image of what you want to do before you can pick the methods that work for you. This post is basically my current playbook on how I am running games. Any time a player has an idea and you say no, the game stalls for a moment. 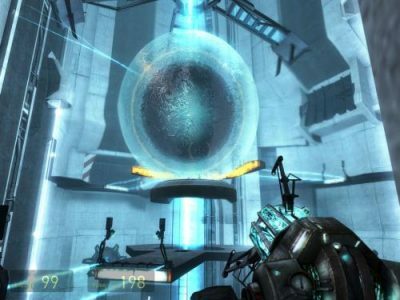 Whatever vague plan was forming in the player’s mind will have to be discarded and a completely new approach considered. Saying yes keeps the game moving forward. Generally you want the game to maintain forward momentum and avoid situations in which players are overthinking things. For that you want to encourage and applaud their crazy ideas, not create the impression that they have to figure out what you think the correct solution should be. Even when the question is something like “Is the bridge made of wood?” and you have not thought about it before, answering yes will probably lead to the most interesting result. Whatever it is that the player is thinking about, it’s probably something that will only work if you say yes. What are the players trying to do? This is probably the most important thing that a GM has to understand. Before you decide the outcome of an action it is crucial to confirm that you and the player are on th same page. If players say they want to do something that seems nonsensical, it’s almost always because their picture of the situation is different from what you meant to describe to them. In an RPG the GM is the eyes and ears of the players. They can always only know what you tell them. If they get something wrong it’s your fault. And that means it’s your duty to make sure that you and the players are imagining the same situation and context. Only when you know what the intended outcome of an action is can you decide what the best method is to handle it. Do we need a roll? Many rules heavy games have a mechanic for almost everything players might want to do. And that leads to a stong tendency to use mechanics for everything. But most of the time doing so is nonsensical. Most actions do not require a die roll. When it seems obvious that an action should succeed it should succeed automatically without a roll. If an action is effectively impossible, no roll is needed either. Dice are rolled when there’s a clear chance for both success and failure and failure also has a consequence. If the character could just keep trying until he rolls a 20 or a 01 then the question is not whether he can do it but how long it will take him. If there is no consequence of failure, no roll is needed. The most common forms of consequence are taking damage, alerting enemies, time pressure and anything that will make it impossible to try again. When player roll dice it should be a meaningful moment, not just tedious routine. Sometimes only the first attempt wil have a consequence but successive attempts will not. For example a character kicking in a door could surprise the people on the other side. But only on the first attempt. If the first attempt fails anyone on the other side will know someone is trying to break the door and be alerted. A second or third failed attempt won’t have any further consequences and need no additional checks. It’s enough to tell the player that it didn’t work the first time and ask if he wants to keep doing it until it works or stop. Generally every action should require only a single roll. If a character disguises himself as a guard and fools the guards at the gate, no additional rolls are needed to fool the guards in the courtyard. That’s still the same situation of wandering around without being noticed. If the character would attempt to enter a restricted area or take a prisoner from the cells then he is doing something that would make people take another closer look at him and a new check might be required. If you would check for every guard the character walks by it would be only a matter of time until a roll fails and the whole plan of getting inside disguised as a guard becomes impossible. What does the other side want? Any time an encountet happens, whether it’s planned or random, the first thing the GM has to do is take a moment and decide what the NPCs or monsters want. It’s almost never to kill the PCs at any price. They might want to rob or eat them, get them to leave, prevent them from getting past, and possibly a wide range of other things. And usually, above all, they want to stay alive. To effectively play the people and creatures the party encounters, whether it leads to a fight or not, you have to know what they want to get out of the encounter. What tactics they use, when they might retreat or surrender, whether they attack first or need to be provoked to fight, and how they might negotiate all depends on what they want from the PCs. Enemies in videogames are stupid and all they can do is running straight at the characters and start hitting until they are dead. Henchmen in movies tend to do just the same. And most RPGs seem to assume the same thing of NPCs and monsters. But that’s a complete waste of interesting interactions and that’s what RPGs should be about, not combat. In the heat of the moment it’s often difficult to come up with interesting ways in which creatures react to spotting the party and so GMs usually default to instant attack. The reaction roll is a very simple and extremely useful mechanic to address that. If the reaction of a creature is not automatically apparent, roll a dice to see what it does. In B/X D&D immediate attack is a very rare result. Much more commonly they are hostile and waiting for a good opportunity to attack or just chase the party away, or they might wish to avoid a fight or even be friendly. The important part to remember when using reaction rolls is to question whether the reaction would really be automatically apparent. It’s a matter of tone for the campaign, but just because something is said to be evil or occasionally eats people doesn’t mean it has to attack. When in doubt, make a reaction roll. Almost all people and creatures encountered by the party want to not be killed above everything else. When it becomes apparent that a fight is lost, have the enemies attempt to save their lives in whatever way they can. They might retreat, surrender, or try to negotiate. But even when a fight can still be won enemies might get too scared by the killing around them and flee in panic anyway. This can be handled by a morale check. 2d6 are rolled the first time someone in the fight is killed and again when the enemy group has lost half of its fighters, either to death or being incapacitated. If the roll exceeds their morale score they will flee, regardless of the tactical situation. In OSR games defeating an enemy in battle gives characters only very little XP compared to the considerable risk they pose and the resources it takes to defeat them. They are a pure nuisance and something to be avoided. Since random encounter rolls are made based on the time the party spends in a dungeon or enemy stronghold, the only way to avoid them is to be quick and don’t spend any unnecessary time in the place. Random encounter checks are also made any time the players do something very noisy that might attract attention, which is an incentive to be sneaky. Random encounters really only work if the players are not meaningfully rewarded by getting into fights. If a random encounter provides a good amount of XP and treasure then they defeat the purpose. Most encumbrance system are way too complex to be fun and slow things down so much that they are just completely ignored. A much simpler system is to have every item have a weight of 1 and let characters carry as many items as their Strength score unencumbred and twice as many with being slowed down to half speed. Exceptionally big items like armor count as two or three items, very small items like keys or papers count as having no weight at all. Going from full speed immediately to half speed seems very unrealistic but is by far the easiest solution to deal with turns on large maps. Having a 3/4 step in between would make it all much more unwieldy. Most OSR games use turns of 10 minutes to track the durations of torches, spells, and potions and check for wandering monster encounters. Usually this is tracked by how much distance of empty tunnels the party has covered. This requires having the whole environment map out at great detail, which I am not fond of. Instead, for larger locations with a lot of empty space, I break the whole sketchy map down into zones of not clearly specified size and each time the party leaves a zone for another a turn has ended. If the party moves at encumbred speed, two moves have ended. In addition, the end of a fight also means the end of a turn, regardless of how long or short it is. Tidying up after a fight tends to take longer than the fighting itself and for the sake of simplicity it’s assumed that another turn has ended once the party continues its exploration. A turn is only approximately 10 minutes, not a precise unit of time. Some turns are longer, some are shorter, and torches, potions, and spells don’t run on an exact timer either. It’s just a simple approximation. Even though I was born in the mid-80s I am very oldschool in my approach that RPGs area about the players making their story, not about the GMs telling their stories. It has nothing to do with nostalgia or snobbery, I just found it to be a vastly superior use of the great potential of roleplaying games once I really understood the idea. Not understanding this is why my campaigns used to be bland and underwhelming. Whatever you put into your campaign is there for the players to interact with. It’s not to show off your creative work. If the players decide to do something that leaves an NPC dead or a cool place destroyed then let it happen. If you are not willing to see it go up in flames, don’t put it in the campaign. The adventure is a story the players are making, not a story they are being told. A good adventure provides things the players can interact with in interesting ways. And GMs don’t know how the players will interact with the things they’ll find so you shouldn’t assume that they will do certain things and then prepare additional scenes based on that. A good adventure is an environment with multiple people who want and do various things. It’s wise to spend some thought on what would happen if the players don’t interfere but don’t write a sequence of scenes that are meant to happen. When you do that the players will make their decisions based less on what they would like to do but more on what they think they are supposed to do. Yes, almost all adventures that are being released are scripts of scenes. And I also think most released adventuresare bad. Probably the biggest mistake that is constantly made in dungeon design is to put obstacles in the way of the party that have to be overcome or the adventure can not continue. In a well designed adventure absolutely everything needs to be optional. And the best way to do that is to always have more than just a single possible route to get to an important place. Failure to do that leads to a long list of really bad problems. 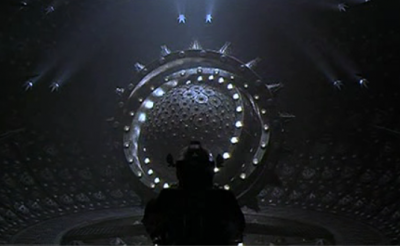 If the adventure can only continue if a creature guarding a gate is defeated, then the players know that they can not lose a fight against it. It will be easy enough to defeat and if things go wrong the GM will help them out and make them win anyway. From this follows that everything they encounter will be defeatable without much trouble, which leads to the conclusion that everything is meant to be defeated. And just like that the game turns into a meat grinder where combat is always the default response to encountering a monster or enemy. Players aren’t really into exploring. Players are into discovering. So add plenty of hidden stuff to adventures that can be discovered through the actions of the players. They will probably miss a good deal of them so prepare them in a way that takes that into account. Don’t make important things hinge on a single die roll. If you want something to be found for certain then make it impossible to miss. It’s not common but still happening all the time that very substantial parts of adventures will only be accessible if the players find a hidden thing, make a saving throw, or succeed on a skill check. When you include such thing, always ask yourself what happens if the players fail. Some games have a lot of rules for battles and others have very little. Even if you have a complex battle system it might seem fun to just rely on the standard maneuvers but every fight will be several times better if it takes place in an interesting battle field that both sides can use to their advantage. Add rubble, pits, fences, pillars, tables, stairs, balconies, barrels with oil, giant spider webs, huge furnaces, and chandeliers to swing on. Nothing is more boring than a featureless square room. In a campaign in which characters get XP primarily from retrieving treasure, my rule of thumb is to take all the possible XP from fighting opponents in a location and multiplying it by 10 to get the value for treasures that can be found in that place. A good amount of it will be in the lairs of creatures but most of it well hidden and easy to miss. In the long run this should lead to a ratio of about 1:6. Treasure is put where it makes sense. 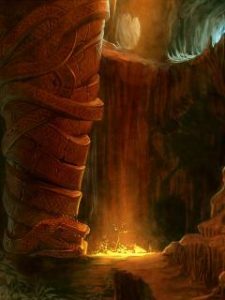 In a location with mostly animals, most treasure would be in hidden staches while in an area with many humanoids much of the treasure would be in their lairs. To have an easier time with encumbrance each treasure item takes up one slot of inventory space and has a value of either 100, 1,000, or 10,000 XP. Thief skills in OSR games are always a weird thing. Thieves have a skill to hide and to sneak but what about other characters who try to quietly move around unseen? And the chance to successfully pull it of is a measly 15% for first level thieves. With less then an 80% chance it’s not worth to even try. Sadly, D&D never explained itself on how this is supposed to work and all we have are various interpretations on what those skills and odds are actually meant to be for. The actual names for hiding and sneaking in D&D are Hide in Shadows and Move Silenty. This means hiding when there’s nothing to hide behind and moving without making any sound that could be detected. These are things that an average person could not do. In situations where other characters would automatically fail without getting a chance to roll dice, a thief might just be able to pull it off with a big amount of luck. For regular hiding and sneaking I simply have characters make a Dexterity check, possibly modified based on how good their hiding places are and how much ambient noise is present. As with stealth, the climbing skill of the thief is actually called Climb Sheer Surfaces. Again, I agree with the interpretation that this applies to climbing things that would normally be impossible. And again, climbing things that are regularly climbable is done with a Dexterity check if necessary. Unless there is time pressure, which there generally is not, a single roll is made to attempt to open a lock. This roll simply determines whether the thief can open the lock or not. If he fails then it’s beyond his skills. I handle the detection of traps in two ways: A general quick lookover and a specific interaction. The thief skill is used only for the former. 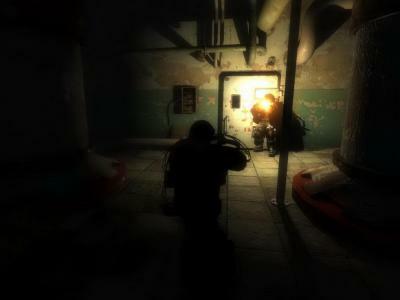 The player can declare that he quickly checks if something looks fishy and a roll is made. This roll is made in secret, which allows me to roll multiple dice in case there are multiple traps. If a roll is a success the character spots the trap. But any player can declare to do specific things to make sure there really isn’t anything hidden. A thief rolling to detect traps is only a chance for auto detection. 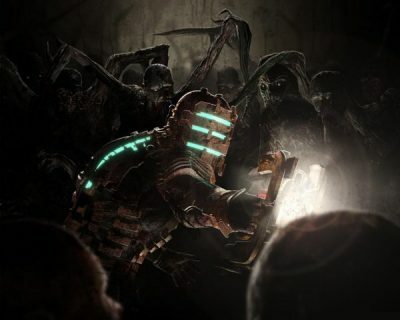 Manual searching will find or possibly trigger a trap based on what the players are doing. In my previous post about modular campaigns I have been rambling about the reasons for structuring a campaign into individual chunks that can easily be moved around, rearranged, and modified. (It’s all still work in progress.) The key idea being to have the convenience of episodic one-shots with an irregular group of players while also giving the players agency in choosing where they want to go and what motivates them and getting a campaign that better captures the spirit and atmosphere of Sword & Sorcery tales. What I haven’t really been talking about yet is how I want to structure each module to get as much out of every session as possible (occasional players should not be left hanging at the end of a session with nothing seeming to have been accomplished) without making thing too rushed and not neglecting a proper buildup of tension and atmosphere. Because that’s something I only worked out these last days. Something I struggled the most with is how to deal with the journey from the town to the dungeon. I am a big proponent of skipping the boring parts that serve mostly as padding to make the adventure feel bigger but contribute very little to make the game feel like an adventure and making it memorable. Especially when you have players who only play four hours every 5 or 6 week you don’t want to unnecessarily draw things out when you could do more of the exciting stuff. Simply starting and ending each session at the entrance seems tempting, but I think that’a throwing out the baby with the bath water. I support the notion that most dungeons should be otherworldly. If the essence of Sword & Sorcery can be broken down to a single phrase it would be the encounter with the supernatural. But for a world to be other and supernatural you have to contrast it with a world that is normal and natural. Both the town and the journey to and from the dungeon are this normal world to which the PCs are native. So, going with the assumption that the wilderness travel is a crucial part of the experience, the next goal has to be to find ways to pack these trips with as much excitement as can be done and making it relevant to the real meat of the adventure that is the dungeon. It’s not often but sometimes you see people make suggestions that seem to be just pure gold. The suggestion someone gave to me is to make the encounters on the trips to and from the dungeon not based on the natural wildlife and local population of the region but on the denizens of the dungeon the path leads to. I think you can actually treat the wilderness journey as the first level of the dungeon. What the party encounters along the way is not unrelated to what is inside the dungeon but already connected to it. With larger dungeons the party might have to make the trip multiple times to haul back the loot and get new supplies, which makes randomly rolled encounters a much more interesting option than having just one or two fixed ones. You can also already include a few “rooms” and branching paths the players may choose from. Sentry posts or creaky bridges that could be collapsed to shake pursuers trying to keep the party from reaching the safety of the town with their loot would be great additions to what could otherwise just be a single straight path through the forest. The wilderness from The Forgotten Temple of Tharizdun comes to mind, though it’s a somewhat crude execution of a great idea and more tedious than adding much to the exploration of the dungeon. Through random encounters players could learn of secret entrances into the dungeon or safe places to rest near it without having to make the whole trip back the the town. I think the only real difference between the “wilderness level” and the dungeon levels would be to make wandering monsters check ever 2 hours instead of every 20 minutes and perhaps only once or twice when the group is making camp for eight hours. There’s not going to be much treasure in it (though perhaps a randomly encountered group of humanoids might be tracked back to their nearby lair) but players already have an opportunity to learn about what is making its home inside the dungeon. And especially in OSR games, knowing is half the battle. Once you reach the proper dungeon I am a big fan of making the players feel that they have come to the other side of the rabbit hole and are not in Kansas anymore. If the dungeon includes surface ruins they often form a kind of border zone. You have reached a strange place and can start exploring but you still have the sun in the sky and fresh air around you and plenty of room to escape if you wish to. But this ends at the threshold beyond which looms the mythic underworld. It can be a door, a cave entrance, stairs leading down, or just a small hole in the ground. Once you cross beyond this point anything could happen. It’s a bit different when the adventure site lies in an enchanted forest. Enchanted forests usually don’t have a threshold and that’s what makes them unsettling in their own way. You make your way through the wilderness anticipating the see the border to the magical realm ahead until you realize that you crossed it long ago and you won’t be able to get out quickly. How to do this well I am not sure yet. I think it might be a good idea to have two different encounter tables for the mundane wilderness and the enchanted forest. The players might only realize that they’ve already reached the magical realm when they encounter its inhabitants. When the dungeon is in an enchanted forest I think there’s no need to for a visible transition from surface ruins to underground passages. The characters have already committed themselves to the dangers of the otherworld. How long the trip should be depends on the overall setup of the module, but for the reasons mentioned previously I wouldn’t make it more than two fixed encounter area per possible path (if you have alternative routes to the dungeon) and an average of two random encounters. In a four hour session you probably don’t want to have more than half an hour for each trip. Now you’ve come to the dungeon itself. How should it be structured? Since the main goal is to allow irregular players to enjoy the game even when jumping in irregularly and to let players have many adventures all over the world I would keep each dungeon relatively limited in size. Usually it shouldn’t take more than two or three trips to a dungeon before the players decide it is time to move on to another module. I don’t imagine playing only the middle one of three adventures into a dungeon to be terribly satisfying. The first contact and the big discovery in the farthest corner are usually the highlights of a dungeon crawl and which give the whole thing context and meaning. With relatively modest sized dungeons I would also recommend sticking mostly to a single theme that ties everything together. If you could split a dungeon into two or three separate dungeons that could each stand on its own, then you probably should. Also a few words about towns here: During each adventure players will spend relatively little time in the town and will have little interaction with the NPCs. What I would do is to not create a completely new town for each module. When the players wrap up a module and you offer them a few new rumors and hooks to pursue you can easily put one of them near the town they are already in, or in a town they have been to in the past. Since modules are meant to be shuffled around regularly as the players move from place to place I think it’s probably the best idea to keep any town NPC for a module very generic. When preparing each module in advance make notes simply for “guardsman”, “merchant”, or “innkeeper”. These roles will then be assumed by whatever fitting NPC is present in the town currently visited by the party. I think the greatest thing that oldschool roleplaying brought to the attention of younger GMs like me is the whole system of wandering monsters, reaction rolls, and morale checks. When I first got into RPGs I occasionally saw mention of them, but they seemed silly and annoying for what I assumed a good adventure to be like and a good riddance in general. But after having played and run games for over 10 years, all the adventures never turned out to be anything like what I had been hoping they would. And I think it really comes down to D&D of that time having abandoned the aforementioned mechanics. Which didn’t start with 3rd edition but actually preceded even AD&D 2nd edition for a good number of years. My first contact with RPGs was Baldur’s Gate and that set a precedent of what I expected adventures to be like and I found it confirmed by AD&D modules I’ve looked at. When you encounter a creature, one side makes a surprise attack and then the fight continues until one side has been wiped out. The characters get XP and the treasure lies where the enemy fell. Having creatures appear randomly and someimes trying to run away would be a nuisance and interrupt the plot. But videogames NPCs are still absolutely primitive compared to one controlled by a GM and I much later learned that most of the modules were not meant to be normal AD&D adventures but tournament modules for conventions where many groups would play the same dungeon simultaneously as a single session one-shot and then compare which party got the most points. Which is why The Tomb of Horrors is so awful. It’s not meant to be part of an ongoing campaign, but unfortunately fails to explain that to GMs who read it. Wandering monsters in a dungeon have the main function of keeping the party moving and the clock ticking. They make resting in a dungeon almost impossible and that means your spells and hit points have to last you through the whole expedition. Since wandering monsters have negligible treasure and roughly 75% of XP are expected to come from collecting gold, fighting them is just a waste of resources and a risk of death with barely any reward. And as wandering monsters are encountered based on time spend in the dungeon, there’s a real incentive to be quick. Giving the majority of XP for treasure also has the effect that it is often more efficient to just steal treasure without a fight and minimize the loss of spells and hit points (and party members). Getting 75% of XP for stealing treasures without defeating the owners will get you more than getting 100% from just one creature. XP for gold seemed silly, but is actually great design. It also makes morale checks much more interesting. An opponent who runs away may abandon its treasure. Every round you don’t have to fight saves you more hit points and spells and allows you to continue the current expedition a bit longer. Yes, they run away with their pocket change, but you still get all the XP for having defeated them. But let’s now look at reaction rolls, which are perhaps the most intriguing element of oldschool roleplaying. A reaction roll tell you how a group of creatures or NPCs will react to encountering the PCs when their reaction is not predetermined by the adventure or obvious. I took notice of this and mentally filed it away to be used with animals encountered in dungeons or NPC parties encountered during overland travel. But what does “obvious” actually mean? A group of zombies? Yeah, obvious. A golem guarding a door? Predetermined by the adventure. But what about a group of orcs sitting around a campfire? Obvious? Well, I always assumed it is, based on fantasy books, movies, videogames, and all the adventures published by WotC and Paizo. But this is a preconception that is not actually supported by the 1981 Moldvay Basic rules. Yes, orcs are chaotic and it says that Chaos generally means evil. But player characters can be chaotic as well and they are members of the party. Chaotic indicates breaking rules and promises when it benefits you and you can get away with it. And what benefit is there in randomly attacking groups of well armed people? I always found it somewhat difficult to interprete the rection table. What does it mean if the result is “Hostile, possible attack” or “Uncertain, monster confused”? But with a bit of searching you can easily find a few examples from fiction. When Bilbo encounters Golum under the mountains, Golum plans to kill him and eat him. But he doesn’t have surprise and knows that frontal attack is risky so he keeps Bilbo talking in the hope of getting an opportunity where he has advantage. That fits very well with “Hostile, possible attack”. Another good example is in Return of the Jedi when Leia encounters the ewok Wicket whose reaction is just spot on “Uncertain, monster confused”. He holds up his spear but only to keep her at a safe distance, not with an intention to attack her. Because she handles the situation well she’s able to get the ewoks as allies. 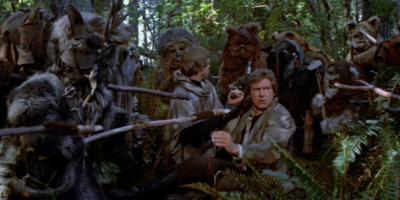 A bit later the others get in a similar situation but Han handles it less well ad the ewoks decide to cook them. Only on a roll of 2 on a 2d6 does a reaction roll actually indicate an immediate attack and a 3 to 5 indicates hostility with a chance that the creatures might attack. This results in only a 28% chance that a fight breaks out without the players initiating it. If you start making reaction rolls for any encounter where the reaction isn’t automatically fixed, it will change the game quite a lot. Orcs and ogres are no longer monsters but people just like bndits, mercenaries, or barbarians. Their culture might be different and unappealing to many of the PCs, but if the players handle it right they can be interacted with just like people. This encourages and supports a play style that is really about exploration and discovery of fantastic environments the PCs will find themselves in. Treasures are an incentive to poke around and find hidden rooms, but seem much less like the main purpose why you go on an adventure. The options to discover things about the environment and the greater world are very much limited when all your interactions are with statues and wall paintings. There is so much more that can be leared by interacting with other people and the knowledge you gain becomes much more useful and meaningful if it can help you with dealing with other people you’ll encounter later. Or possibly people you encountered before and who might reward you for sharing your discoveries. Another fascinating part of the rules that had almost entirely disappeared are retainers. In 3rd edition you have to be at least 6th level and spend one of your precious few feats to get only one retainer. In Basic everyone can have around 4 at first level for free. (You have to pay wage, but that’s no limited resource.) My assumption was that you’re meant to post job offet notes at the market place and then pick one of the people who come to apply. But that’s not what the rules demand. A much more fun and interesting option is to recruit people you meet on adventures. It says retainers can be of any level or any class but not have a higher level than the PC they follow. But the Hit Dice of a monster are effectively the same as class levels in every way. Once you make it practice to befriend monsters, why not let players take them along as retainers? The GM would have to rely on making good judgement calls on what kinds of monsters might possibly be hired. A black pudding or a purple worm would be silly. But if it’s reasonably intelligent, able to integrate into society, and the player mange to get it friendly, why not? In a discussion about The Maze of the Blue Medusa, one person mentioned that despite many highly positive reviews for OSR “settings”, there seem to be barely any people who say that they actually ran a game in Red Tide, the Red and Pleasant Land, Qelong, or Yoon-Suin. Despite the praise and the money people pay for it, they seem to be barely getting used by anyone. Which wouldn’t really be that surprising as the people who enjoy this kind of content tend to be people who also create a lot of their own custom content for the campaigns they run. The main draw seems to me, and probably many others, to salvage these books for ideas. I regularly buy books for games I don’t have or know the rules for, or ever have any intention to play. It’s always all idea mining for me with everything I get for RPGs. I don’t think I ever used anything out of the box since my earliest hears with D&D 3rd edition. And I believe many of the people who make OSR settings are very much aware of that. Vornheim and Yoon-Suin can’t really be considered settings in the traditional sense and are really all about being toolboxes for creating your own content. My impression of Red Tide is that the setting of the islands and the backstory of the setting is really mostly a practical example for how a world using the tools in the book could look like. My previous Ancient Lands setting was very traditionally designed like the many settings of the late 80s and the 90s, but when I started all over with a blank canvas to do the Old World I abandoned that approach pretty much entirely. It’s not practical for running my own games and I doubt there would be more than two or three GMs in the world who would actually run a campaign if I would get it into a releasable form. I recently looked into One Page Dungeon after talking somewhere about my frustration with typical D&D settings being so vague on adventure locations to be practically useless. As all dungeons are made independently by completely different people and the only format restriction is that it has to fit on a single page, people have been trying out a lot of different things with that idea. And I think this could be a really good approach for small scale campaign setting writers in the coming years. Completely abandoning the idea that a setting is a single world and instead providing collections of thematically matching but mostly stand alone pieces of content. I am still settling in after my recent move across the country back to the grim North of the Baltic Sea, looking to pick up my great grandfather’s trade as a carpenter, or another great grandfather’s trade as a saddler, or take the old family passion of gardening as a job in a plant nursery. (And yes, we are almost as rural as you can get in central Europe.) So this idea is still somewhat half baked, but something I consider interesting to ponder. Many campaign settings published for RPGs tend to written in a way that makes them interesting ro read, but not necessarily good to actually play in. When a 300 page setting book tells me that there is a burried ruin at the end of an old elven road in the forest, which is constantly guarded by a dozen or so elves from local clans, and which turn away everyone until they have a special permit from their leaders, it does get you interested and makes you want to explore the place. If you are a player. But if you are a GM, what are you going to do with it? A few words on why the elves make the effort to post a permanent heavy guards and what reasons would get the players permission to enter would be more than just useful. Such information is necessary. And it’s something that I rarely seem to find. Published campaign settings never seem to be able to decide if they are an overview for players with knowledge that player characters could easily know, or GM guidebooks that provide hidden behind the scenes information to run adventures. I’ve been long of the opinion that these kinds of books should simply be split. A main volume with the standard public informtion, and a smaller booklet with secret knowledge for GMs. But how would such a GM book look like? I think a good length would probably be about half a page for each location, including a basic overview of what the place looks like, what special features it has, what it is inhabited by, and what kind of big secret it hides. Even with small font side you get half a page very quickly. But I think as content goes this might be enough. Enough for GMs to use it as a starting point to create their own location based adventures. Some ominous words about a room with six portals to other worlds being hidden somewhere in the deepest halls, or frog-like creatures seen dancing around a large fire during stormy nights is insufficient for GMs. It makes players curious and interested to check out these places, but doesn’t give any help to GMs who still have to make up some cool background and story for it from basically nothing. What GMs need is not a finished adventure for every place in the setting, but a solid concept of what each place is meant to be and what it’s special feature is that the players are meant to discover. In many ways, this would be making a campaign setting like a coloring book. You provide the outlines that already let you see what you’re dealing with, but it’s up to the GM to bring it to life by creating maps, chosing the types and numbers of creatures to be found there, the current situation the players will encounter, and so on. Every GM’s dungeon will be different, so it doesn’t matter much if some of the players have read the description in the past. They will always encounter something completely new behind each door and corner. And even knowing that somewhere in the dungeon is an undead warrior guarding the tomb of a mummified sorcerer who is gathering his strength to return and conquer the country wouldn’t give away how exactly an encounter with these two would play out. As someone wrote a while back, people don’t like exploration. People like discovery. A campaign setting that only gives you things to explore but no things to discover isn’t really well suited for use in an RPG. And even as a GM, creating places to explore is easy. Filling them with things to discover is much harder, especially for a world you’re only passingly familiar with. I think a lot more could be done in this regard than it has been in the past 30 years. Alright, some people might be wondering, what is this all about? A few weeks ago I wrote a short post about the problems I have with published adventures. One of the pretty big problems that makes most adventures unusable to me is that they are not only written for a different game than the one I am running, but have also been designed for a group of player characters of a specific power level. 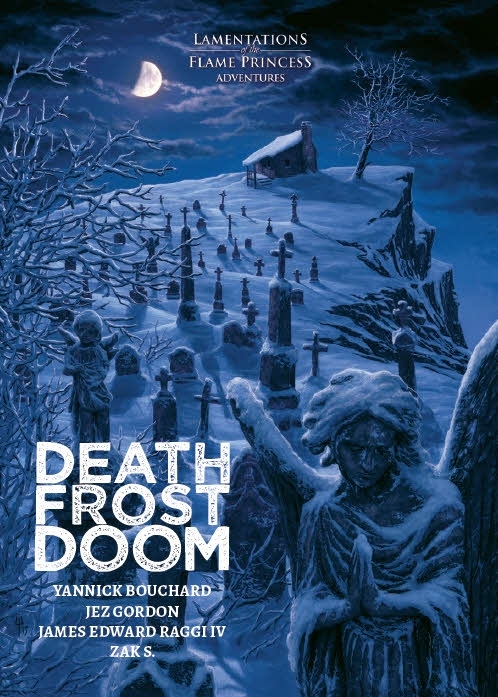 While am talking a lot about published adventures here, the main point I want to make further down is really about designing adventures in general, so even if you don’t usually use published adventures either, this might still be interesting to read. The earliest adventures for Dungeons & Dragons were pretty vague on this subject, simply saying they are for adventurers of “1st to 3rd level” or characters should be “5th to 10th level”. Since at that time nobody had any pretense that character levels and monster experience were an exact science, it really was just very rough eyeballing. But soon it got more specific like “This module is designed for 6-8 characters of 4th to 7th level. […] The party should possess somewhere between 35 and 45 levels of experience.” Since experienced henchmen were a common feature of the game at that time, it really wasn’t any big deal to get a few more of them to make the party ready for adventure. I make no secret of the fact that I think AD&D was really terribly written and had really bad ways to deal with numbers. But while the 3rd edition did some good work in straitening up the rules (mostly fixing attack bonus, armor class, and XP tables), it also went of into a completely wrong direction with long steps. A derection into which I, being totally new to RPGs, happily followed. Great. What if the characters are already 2nd level? What if I have another adventure I want to run that is for 2nd level characters? At these very low levels it’s not such a big deal yet, but when you get adventures that are for 10th level characters and take them to 14th level it does become a real issue. My campaigns are usually with new players and run for perhaps a year or so, so I usually ran games with characters that are all 1st or 2nd level. (It’s easier for new players.) Which means lots of great adventure I never got an opportunity to run. But it got worse. The way things were described in the rulebooks and the first adventures that were published for 3rd edition, players had the expectation that the encounters would be “balanced” and “suitable for their level”, which means they should win the fight without any big trouble. I did. I am guilty. I was young and stupid. But of course, that idea is nonsense. 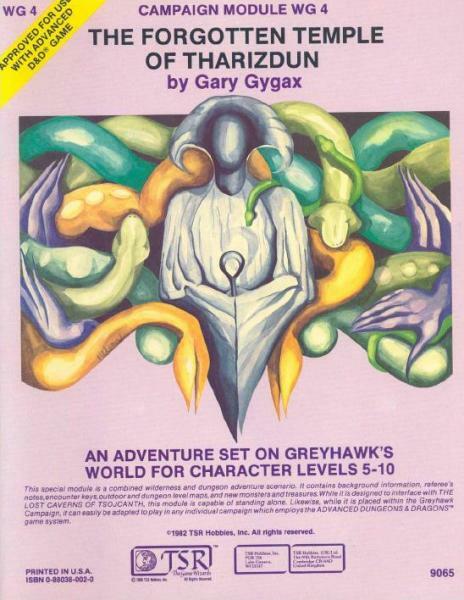 While Gygax was pretty bad at explaining himself, he did understand that D&D was not just a game about individual fights, but also, and perhaps more importantly, about rationing your strength and resources. Part of that is judging when to let the warriors clear the room with their swords and when the wizards unleash their full awesome power against enemies the warriors can’t handle on their own. And when you put it this way, it is obvious that individual encounters should be highly imbalanced in either direction. Many fights should be pretty easy while some should be pretty hard, and the key to being a successful adventurer is being able to tell which type of fight you’re currently dealing with. If you rush in with full force, your resources will be quickly exhausted. And if you then get into a fight against a strong enemy, it could be your death. But if all fights are balanced to a level where the players will be able to win without great difficulty or great risk, what is there really to do for the players other than “I guess I attack it with my sword again” over and over and over. 3rd edition tried to “fix” this with lots of special attacks and feats. But that’s where everything started to go wrong. They tried to make the round by round attack and damage routine more entertaining, but that part was never meant to be center of the game. It really was about judging the strength of your enemies, using the environment to your advantage, and making calls which fights to pick and which ones to avoid. The notion that fights should be balanced according to a mathmatical calculation killed all that. The Sunless Citadel did include a fight that would be really difficult to win and force players to retreat and come up with outside the box solutions or avoid that particular monster entirely. But as the story is being told, people complained about the encounter being unbalanced and that practice was discontinued from there on. Paizo eventually became not only the biggest creator of published adventures but actually the biggest RPG company of all. (Seems like WotC has left the field.) But even though there’s lots of great stories, I only really ran three of their adventures. Flight of the Red Raven and Escape from Meenlock Prison and The Automatic Hound from the Dungeon magazine. All three of which I completely rewrote to fit the size and level of the party I was running them for. I know, a bold statement. But think about it? What are the really cool and exciting scenes you love from novels, movies, comics, or video games? And how many of them have the characters walking down corridors and opening every door, to deal with the things they find in each room one at a time? Sure, sometimes there are really cool scenes that take place inside of dungeons. But these usually are not about exploring the place, but generally about seeking something or someone very specific inside that place. It’s the sneaking past the guards to reach the target and then finally confronting it that makes the whole event exciting. I readily admit that both as a player and a GM, I very much favor a highly narrative style. And a game of managing resources and collecting treasure can be fun. Risk and Settlers are my favorite board games and I spend insane amount of time when playing STALKER to search every piece of rusted pipe and then drag myself back to camp massively overburdened with 40 first aid kits and a dozen high quality assault rifles to sell. But reading GMing advice and keeping up with many of the popular RPG forums, I often get the impression that these two quite different aspects of RPGs get thrown together as if they were the same. Which they are not. Having a dungeon with lots of unique rooms, that each have special features and often include interesting creatures is a good thing. If you are playing the game to have a dungeon crawl. My personal favorite style of fantasy is Sword & Sorcery and I wanted recreate the special traits of that genre in my current campaign, which I’ve started this January. And while my players all seem to have had great fun so far, I am personally rather disappointed with what I’ve come up with so far. Because, as I think now, I was still approaching the adventures starting with the dungeons. I had my Monster of the Week and laid a track to its lair for the PCs to follow, now all I needed was to add some padding to stretch the game between finding the entrance to the lair and encountering the monster. Actually, a lot of padding, because you just need to have a cool dungeon. But looking back, the dungeon wasn’t cool and in the end it really was just pure padding. The only result it had was draining some hit points from the PCs, and that really only because they had no priest or any healing potions. I havn’t written the summary of our last session, because there really isn’t much interesting to say. And as I’ve said in another article two weeks ago, if a part of the adventure is not worth retelling later, it didn’t had to be in the adventure in the first place. Instead, I should have spend much more preparation on the encounter with the boss at the end of the dungeon, who really just ended hitting the PCs with his claws as soon as they opened the door until he was dead. In closing: A dungeon is not an adventure. A dungeon is the stage for an adventure, but even the coolest dungeon can not substitute for a story. (Which in a dungeon crawl wouldn’t be an issue.) Right now, this is just one piece of insight I want to share here and I don’t have a lot of advice what to do about it yet. But it took me over 10 years to figure this out, so maybe this can be a nudge for other GMs to rethink what they’ve been doing so far as well. While I was pondering whether the new Star Wars RPG by Fantasy Flight Games might be something worse purchasing instead of sticking with Star Wars Saga Edition (the FFG game require three $60 books, of which only one has been released yet; but SE is a d20 game with all the baggage that includes), I considered giving another chance to the generic class-less games that are out there. There’s a lot of praise for Burning Wheel and Savage Worlds, but Fate Core brings with it the huge advantage of being entirely free for download. I have to admit that I am still not a big fan of Fate Points (Action Points, Bennies, Force Points, Luck Points, whatever you want to call them) and I can say outright that I think using Fudge Dice only has the purpse of selling special dice to me (though the game appears to be perfectly playble with 2d6 instead), but there’s really a lot of ideas in that game that frankly should be in every pen and paper game ever published! It’s not even strictly mechanical stuff, but really just some basic ideas how to approach the creation of character personalties, campaign setups, and encounters. Things that can be applied to probably every RPG that exists. One thing that I really, really like – as someone who thinks miniatures have no place outside of tactical wargames – is to define the battlefield for encounters as a number of zones. The idea is, that you come up with a location for an encounter and divide it into a couple of zones that represent different kinds of environment. For example, an attack of a small hut could have the zones “Inside”, “Front Porch”, “Back Porch” and “Roof”. On each characters turn, they can move from one zone to another one and still get to take one action. In the first round, you could enter the “Front Porch” zone and then throw a smoke grenade through a window, and in the second round you move from “Front Porch” to “Inside” and try to tackle the enemy. The effect from the smoke grenade would now also affect only the “Inside” zone. JAMES MACKENZIE on So why don’t you use the regular guards? What do you need us for?